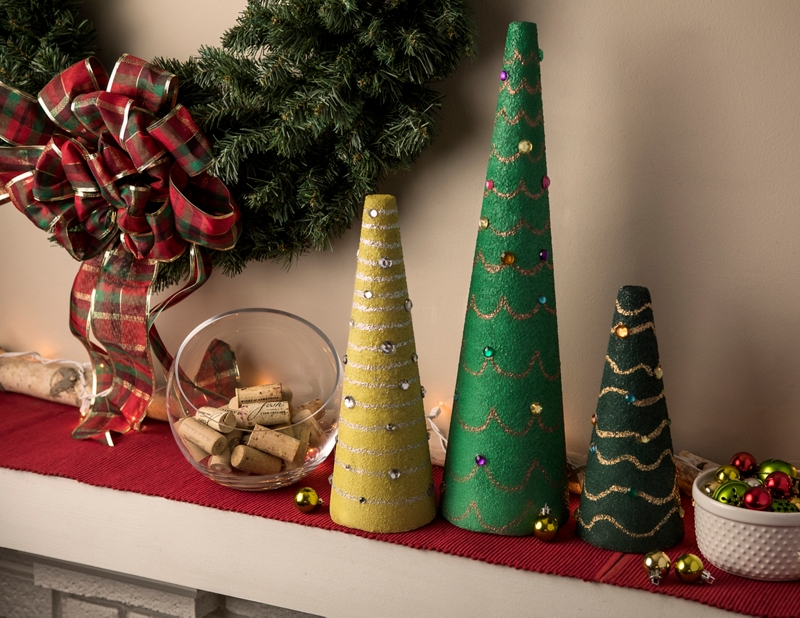 Use Krylon green shades and metallics to create festive holiday décor! On a covered surface in a well-ventilated area, place one cone at a time on a Lazy Susan to spray with Krylon Craft Foam Primer. Allow the primer to cure for 48 hours before topcoating. Once the primer is fully cured, spray the large cone with Krylon ColorMaster Paint + Primer in Gloss Emerald Green, the medium cone with Krylon ColorMaster Paint + Primer in Gloss Ivy Leaf, and the small cone with Krylon ColorMaster Paint + Primer Satin Hunter Green and allow to fully dry. One the topcoats are fully dry, use Krylon Leafing Pens to add a garland effect to the cone trees. In the pictured project, we used Copper on the large tree, Silver on the medium tree, and Gold on the small tree. Once the garland details have dried, use a hot glue gun and adhere sequence to the tree to resemble lights and ornaments.